As Middlesbrough and Newport County go head-to-head in this weekend’s FA Cup in a tie dubbed the ‘Transporter Derby’, Historian and Boro fan Dr Tosh Warwick of Manchester Metropolitan University looks at the history and links between each town’s iconic bridges…. As soon as the draw for the FA Cup was made earlier this month and Middlesbrough and Newport County drawn together, the tie was dubbed the ‘Transporter Derby’ with fans and journalists taking to social media to point out the two iconic bridges that connect the two towns. In the build up to the game Tony Pulis, a former Newport County footballer and now Middlesbrough manager, would not be drawn on which was bridge was best. The story of the Grade I listed Newport Transporter Bridge and Grade II* Listed Tees Transporter Bridges can be traced back to Victorian times and the issue of crossing busy tidal rivers to access docks, iron and steelworks for work. The first modern transporter bridge opened in 1893 in Portugalete near Bilbao some 13 years before the Newport Transporter and almost twenty years before Boro’s crossing first traversed the ‘Steel River’. Yet, Middlesbrough might have been the first owners of a transporter bridge if the local corporation had embraced Charles Smith for a ‘Bridge Ferry’ across the Tees, plans ultimately rejected in favour of improved ferry facilities. It was Newport that would boast a transporter bridge first, with Borough Engineer Robert Haynes a key figure in pursuing the solution to crossing the River Usk. Like the River Tees, any bridge could not impede the river traffic serving the steel industries and docks nearby or could not have long approaches to gain the height necessary to allow high mast ships to pass. The transporter bridge method met all these requirements and Haynes would go on to be the Joint Engineer on the project with Ferdinand Arnodin, the French designer credited with the design of the concept and who informed the design of Middlesbrough’s crossing. The Foundation Stone was laid in 1902 and the bridge officially opened on 12th September 1906 by Godfrey Morgan, Viscount Tredegar at a rain soaked ceremony. Just as 113 years later Pulis provides a connection between South Wales and the Tees Valley, there was a connection between the two areas in the realisation of the Newport scheme. Cleveland Bridge – who would go on to design Middlesbrough’s bridge – were amongst the firms that worked on Monmouthshire’s industrial icon, which also boasts steelwork stamped ‘Dorman Long’ – the Middlesbrough steel firm responsible for the construction of Sydney Harbour Bridge. After much debate and controversy, Middlesbrough’s Transporter Bridge was opened on 17th October 1911 by Prince Arthur of Connaught, providing a crucial link for ironworkers across the River Tees who had previously had to endure dangerous, packed ferry journeys to and from Port Clarence from the ‘Ironopolis’ of Middlesbrough. Both bridges would play a vital role in the infrastructure and economy of their towns in the ensuing decades and would survive two World Wars – unlike a number of their sister bridges on the continent - with the Tees landmark withstanding a Luftwaffe bomb. Both ‘flying ferries’ endured mixed fortunes in the following decades with the future of both bridges often in doubt. Problems had started as early as the 1930s with calls by councillors to scrap the Newport crossing amidst operating issues and the rise of the motor car – today the gondola accommodates six cars compared to Middlesbrough’s nine. Such calls heightened in the post-war decades with a number of enforced closures that saw the icons dubbed white elephants and archaic as the ageing landmarks struggled under the strain of modern usage. 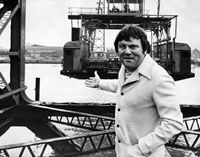 However, both bridges found defenders amongst councillors, press and the public, even after comedian Terry Scott drove his Jaguar off the Tees Transporter Bridge on a March night in 1973 mistaking the bridge for a normal crossing. The late 1970s would bring decline in Middlesbrough and Newport, both hard-working, tough towns defined by pride in industry. The landscape around the bridges would see major employers disappear and communities fractured, whilst traffic on the Tees and Usk dropped. The landscape along the Usk might have changed even more in the late 1960s had the proposals by Gwent exile and Los Angeles businessman Douglas Jones to purchase the bridge and relocate it to Hollywood or Niagara Falls succeeded. Decades later – fictionally - the Geordie schemers of BBC’s Auf Wiedersehen, Pet would go one better and relocate the Tees Transporter Bridge to Arizona! The fate of the towns’ football clubs during the late twentieth century echoed that of their ailing bridges. The Newport Transporter faced closure for a decade from 1985 due to essential works, whilst the Middlesbrough structure encountered breakdowns and in the ensuing years would eventually close for two years for repairs. The turmoil faced by the bridges was mirrored on the football pitch. In 1986, with the gates of then home Ayresome Park locked, Middlesbrough staved off liquidation at the eleventh hour thanks to the efforts of a group led by current Chairman Steve Gibson. 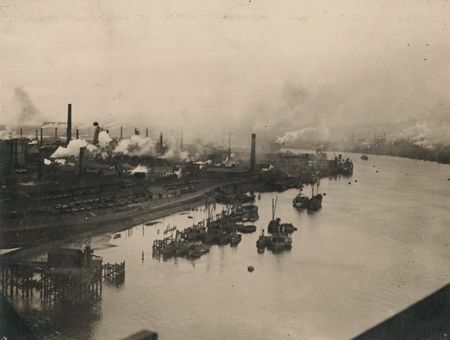 Newport County – whose origins have links to the Transporter Bridge via the crossing encouraging Lysaght’s steelworks to set up on the Usk and with it bringing workers from Wolverhampton who would set up a football team - were less fortunate. The club went out of business in 1989, with the phoenix club Newport AFC set up by a group of supporters, eventually adopting the name Newport County AFC and enduring exile from the town until eventually returning in 1994. 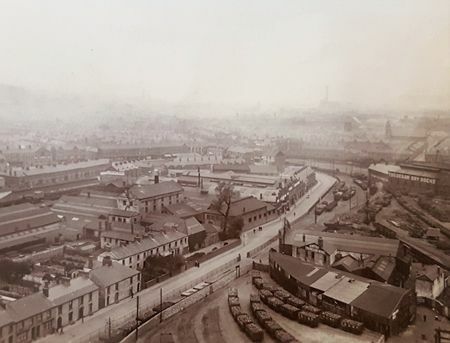 Since the new millennium, both bridges and the surrounding areas have been the centre of regeneration efforts and heightened appreciation of their historic value and connection to a rich industrial heritage. In July 2000, Fred Dibnah would unveil Middlesbrough’s new Transporter Bridge Visitor Centre and two months later Newport’s Mayor cut the ribbon on Monmouthshire’s equivalent. Both structures too have been the beneficiaries of support from the Heritage Lottery Fund (HLF) in moving away from their original intention as a functional crossing to visitor attractions. The HLF provided £2.6m funding for the refurbishment and enhancement of the Tees Valley’s bridge that has included renovation of the gondola, Visitor Centre enhancements and a glass lift allowing tourists to access the upper walkway – although weather permitted the two hundred plus stairs are still an option. In South Wales, Newport City Council has recently been awarded £1m HLF support to progress plans for a £10m refurbishment and development of a new visitor experience. Just as the bridges have enjoyed improved fortunes since the 1980s, so too gave the football teams. The Transporter Bridge has provided the backdrop for the Boro’s rejuvenation in recent decades. As the club left behind Ayresome Park for the state-of-the-art Riverside Stadium, the Transporter Bridge was woven into the home and away shirts for the promotion season of 1994-95 and the foray into life in the Premier League at the new stadium built in the shadow of the area’s ‘majestic dinosaur’. Middlesbrough would go on to enjoy the most successful spell in their history, whilst down in South Wales Newport County would experience a renaissance of their own, eventually securing promotion to the football league in 2013. Saturday’s game in the shadow of one of the two iconic bridges will hopefully prove to be a classic that brings together two towns and supporters alike not only connected by their landmark ‘flying ferries’ but also shared experiences of the ups and downs of life in an industrial community, a common heritage..and desire to reach the Fifth Round of the FA Cup.